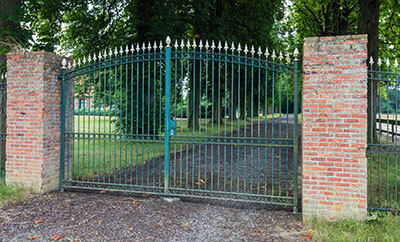 These tips will help you keep your gate in perfect condition. Learn how to paint, repair and maintain it. Your gate will wear sooner if you keep opening it to go through on foot. It will also be safer for you to stay out of the driveway. After all, gate openers are not designed to control pedestrian traffic according to our experts. Gate tracks get dirty easily since they are exposed to winds and elements. Debris, tree sticks and other objects might prevent the sliding gate wheels from rolling and they might damage the tracks. Try to clean them as often as possible to avoid problems. This is especially important if you have really old components. If you keep using these outdated parts, they are only going to cause more problems in the future, and they can affect the components that are functioning well. They don’t improve the gate’s performance. Make sure to pick high-quality and durable replacements. If you have a gate opener, you should also maintain it regularly, just like the gate itself. This includes conducting tests, inspections and other maintenance tasks. When it malfunctions, you can hire our professionals to check and fix it right away. They are the strongest and the most durable among their counterparts. This is especially the case when compared to the hard plastic models. Steel wheels are highly resistant to weather damage and water damage, in particular. Cast iron wheels, on the other hand, may not pull off reliable performance and don’t have high resistance to rust.